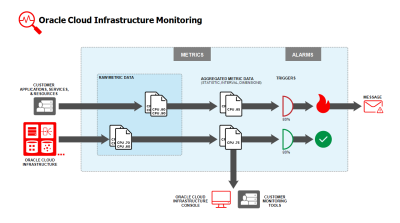 The Oracle Cloud Infrastructure Monitoring service enables you to actively and passively monitor your cloud resources using the Metrics and Alarms features. The cloud objects that your company's employees create and use when interacting with Oracle Cloud Infrastructure.. Resources, services, and applications emit metrics to the Monitoring service. Common metrics reflect data related to availability and latency, application uptime and downtime, completed transactions, failed and successful operations, and key performance indicators (KPIs), such as sales and engagement quantifiers. A bare metal or virtual machine (VM) compute host. The image used to launch the instance determines its operating system and other software. The shape specified during the launch process determines the number of CPUs and memory allocated to the instance.. You can then use this data to determine when to launch more instances to handle increased load, troubleshoot issues with your instance, or better understand system behavior. For application health, one of the common KPIs is failure rate, for which a common definition is the number of failed transactions divided by total transactions. This KPI is usually delivered through application monitoring and management software. As a developer, you can capture this KPI from your applications using custom metrics. Simply record observations every time an application transaction takes place and then post that data to the Monitoring service. In this case, set up metrics to capture failed transactions, successful transactions, and transaction latency (time spent per completed transaction). The trigger rule and query to evaluate and related configuration, such as notification details to use when the trigger is breached. Alarms passively monitor your cloud resources using metrics in Monitoring. transitions back to the OK state, or when an alarm is reset. You can search for alarms using Search-supported attributes. For more information about Search, see Overview of Search. For attribute descriptions, see Alarm Reference. The following concepts are essential to working with Monitoring. The result of applying a statistic and interval to a selection of raw data points for a given metric. For example, you can apply the statistic max and interval 1h (one hour) to the last 24 hours of raw data points for the metric CpuUtilization. Aggregated data is displayed in default metric charts in the Console. You can also build metric queries for specific sets of aggregated data. For instructions, see Viewing Default Metric Charts and Building Metric Queries. The alarm query to evaluate and the notification destination to use when the alarm is in the firing state, along with other alarm properties. For instructions on managing alarms, see Managing Alarms. The Monitoring Query Language (MQL) expression to evaluate for the alarm. An alarm query must specify a metric, statistic, interval, and a trigger rule (threshold or absence). The Alarms feature of the Monitoring service interprets results for each returned time series as a Boolean value, where zero represents false and a non-zero value represents true. A true value means that the trigger rule condition has been met. For more information, see Building Metric Queries and the query attribute description in the Alarm API reference. A data point is either raw or aggregated. Raw data points are posted by the metric namespace to the Monitoring service using the PostMetricData operation. The frequency of the data points posted varies by metric namespace. For example, your custom namespace might send data points for a given metric at a 20-second frequency. Aggregated data points are the result of applying a statistic and interval to raw data points. The interval of the aggregated data points is determined by the SummarizeMetricsData request. For example, a request specifying the statistic sum and interval 1h (one hour) returns a sum value for each hour of available raw data points for the given metric. A qualifier provided in a metric definition. Example: Resource identifier (resourceId), provided in the definitions of oci_computeagent metrics. Use dimensions to filter or group metric data. Example dimension name-value pair for filtering by availability domain: availabilityDomain = "VeBZ:PHX-AD-1"
The time period between each posted raw data point for a given metric. (Raw data points are posted by the metric namespace to the Monitoring service.) While frequency varies by metric, default service metrics typically have a frequency of 60 seconds (that is, one data point posted per minute). See also resolution. The time window used to convert the given set of raw data points. The timestamp of the aggregated data point corresponds to the beginning of the time window during which raw data points are assessed. For example, for a five-minute interval, the timestamp "2:05" corresponds to the five-minute time window from 2:05 to 2:09:n. During the time window, the value of this aggregated data point dynamically updates. The final value for the aggregated data point is obtained when the last raw data point is assessed. There may be a short delay before the final value is posted. The following example query specifies a 5-minute interval. CpuUtilization[5m].max() For supported values, see Monitoring Query Language (MQL) Reference. The content that the Alarms feature of the Monitoring service publishes to topics in the alarm’s configured notification destinations. A message is sent when the alarm transitions to another state, such as from "OK" to "FIRING." For more information about messages, see How Monitoring Works. A reference provided in a metric definition. Example: unit (bytes), provided in the definition of the oci_computeagent metricDiskBytesRead. Use metadata to determine additional information about a given metric. For metric definitions, see Supported Services. A measurement related to health, capacity, or performance of a given resource. Example: The oci_computeagent metricCpuUtilization, which measures usage of a Compute instance. For metric definitions, see Supported Services. An Oracle-assigned unique ID called an Oracle Cloud Identifier (OCID). This ID is included as part of the resource's information in both the Console and API..
A set of references, qualifiers, and other information provided by a metric namespace for a given metric. For example, the oci_computeagent metric DiskBytesRead is defined by dimensions (such as resource identifier) and metadata (specifying bytes for unit) as well as identification of its metric namespace (oci_computeagent). Each posted set of data points carries this information. Use the ListMetricData API operation to get metric definitions. For metric definitions, see Supported Services. A bare metal or virtual machine (VM) compute host. The image used to launch the instance determines its operating system and other software. The shape specified during the launch process determines the number of CPUs and memory allocated to the instance. lists the metric namespace oci_computeagent as the source of the CpuUtilization metric. For metric definitions, see Supported Services. The cloud objects that your company's employees create and use when interacting with Oracle Cloud Infrastructure. or aggregated across all resources in the compartment. Within a metric chart in the Console, each metric stream is represented as a line. By default, metric streams are resource-specific, so the chart displays a line for each resource. If you choose to aggregate all metric streams, then the chart displays one line for all resources. Protocol and other details for sending messages when the alarm transitions to another state, such as from "OK" to "FIRING." The details and setup may vary by destination service. For the Notifications service, each destination includes a topic and subscription protocol (such as PagerDuty). For more information about messages, topics, and subscriptions, see Notifications Overview. Software that allows a Compute instance to post raw data points to the Monitoring service. Automatically installed with the latest versions of supported images. See Enabling Monitoring for Compute Instances. The Monitoring Query Language (MQL) expression to evaluate for returning aggregated data. The query must specify a metric, statistic, and interval. For more information, see Building Metric Queries. The period between time windows, or the regularity at which time windows shift. For example, use a resolution of 1m to retrieve aggregations every minute. As shown in the following illustration, resolution controls the start time of each aggregation window relative to the previous window while interval controls the length of the windows. Both requests apply the statistic max to the data within each five-minute window (from the interval), resulting in a single aggregated data point representing the highest CPUutilization counter for that window. Only the resolution value differs. This resolution changes the regularity at which the aggregation windows shift, or the start times of successive aggregation windows. Request A does not specify a resolution and thus uses the default value equal to the interval (5 minutes). This request's five-minute aggregation windows are thus taken from the sets of data points emitted between minute 0 to minute 4:n, minute 5 to minute 9:n, and so forth. Request B specifies a 1-minute resolution, so its five-minute aggregation windows are taken from the set of data points emitted every minute from 0 to 4:n, 1 to 6:n, and so forth. The aggregation function applied to the given set of raw data points. For supported statistics, see Monitoring Query Language (MQL) Reference. A configuration to avoid publishing messages during the specified time range. Useful for suspending alarm notifications during system maintenance. Each suppression applies to a single alarm. In the Console, you can apply one definition of a suppression to multiple alarms. The result is an individual suppression for each alarm. For instructions on suppressing alarms, see To suppress alarms. The condition that must be met for the alarm to be in the firing state. A trigger rule can be based on a threshold or absence of a metric. The trigger rule and query to evaluate and related configuration, such as notification details to use when the trigger is breached. Alarms passively monitor your cloud resources using metrics in Monitoring. to notify you when these metrics meet alarm-specified triggers. A qualifier provided in a metric definition. (Monitoring service.) Example: Resource identifier (resourceId), provided in the definitions of oci_computeagent metrics. and metadata. For example, the Compute service (metric namespace "oci_computeagent") posts this data for monitoring-enabled Compute instances. The posted data includes all oci_computeagent metrics, such as CpuUtilization. Metric data posted to the Monitoring service is only presented to you or consumed by the Oracle Cloud Infrastructure features that you enable to use metric data. Indicator of the resource, service, or application that emits the metric. Provided in the metric definition. (Monitoring service.) Example: oci_computeagent. You can feed the aggregated data into a visualization or graphing library. Metric and alarm data is accessible via the Console, CLI, and API. For retention periods, see Storage Limits. An endpoint for a topic. Published messages are sent to each subscription for a topic. Supported subscription protocols include Email and HTTPS (PagerDuty). (Notifications service.). For more information about the Notifications service, see Notifications Overview. The reason for sending a message is indicated by its type. OK_TO_FIRING: The alarm changed from OK status to FIRING status. FIRING_TO_OK: The alarm changed from FIRING status to OK status. REPEAT: The alarm is maintaining a FIRING status and repeat notifications are configured. RESET: The alarm is not detecting the metric firing; the metric is no longer being emitted. An example scenario for a reset is termination of the resource that was emitting the metric. Unique identifier that can be used for de-duplication. The alarm's configured display name. The alarm's configured message body. The reason for sending the notification message. Valid values: See Message types. The time when the alarm was triggered, in milliseconds since epoch time. List of alarms related to this notification message. The version of the alarm message format. The number of metric streams represented in this notification message. List of dimension key-value pairs that identify each metric stream. The list is limited to a hundred entries. Empty for an alarm with a status of OK. Example message "High CPU Utilization" for an alarm that is continuing to be in the FIRING state. In this example, the message includes two metric streams: one for "myinstance1" and another for "myinstance2." You can access the Monitoring service using the Console (a browser-based interface) or the REST API. Instructions for the Console and API are included in topics throughout this guide. For a list of available SDKs, see Software Development Kits and Command Line Interface. Console: To access Monitoring using the Console, you must use a supported browser. You can use the Console link at the top of this page to go to the sign-in page. You will be prompted to enter your cloud tenant, your user name, and your password. Open the navigation menu. Under Solutions, Platform and Edge, go to Monitoring. API: To access Monitoring through APIs, use Monitoring API for metrics and alarms and Notifications API for notifications (used with alarms). Administrators: For common policies that give groups access to metrics, see Let users view metric definitions in a compartment and Restrict user access to a specific metric namespace. For a common alarms policy, see Let users view alarms. To authorize resources, such as instances, to make API calls, add the resources to a dynamic group. Use the dynamic group's matching rules to add the resources, and then create a policy that allows that dynamic group access to metrics. See Let instances make API calls to access monitoring metrics in the tenancy. See Monitoring Limits for a list of applicable limits and instructions for requesting a limit increase. Other limits include the following. When you query metrics and view metric charts, the returned data is subject to certain limits. Limits information for returned data includes the 100,000 data point maximum and time range maximums (determined by resolution, which relates to interval). See MetricData Reference.